Casey Blue lives in East London's grimmest tower block and volunteers and a local riding school, but her dream is to win the world's greatest Three Day Event: the Badminton Horse Trials. When she rescues a starving, half wild horse, she's convinced that the impossible can be made possible. But she has reckoned without the consequences of her father's criminal record, or the distraction of a boy with melty, dark eyes, with whom she refuses to fall in love. I bought this book a while ago but I have only just recently read and finished it so I might as well review it! This is indulges one of my many guilty pleasures...horses. I think it stemmed from my Grandad's passion. In his younger days, he was a rather impressive jockey (even though he was 6ft ha ha) and then as his bones grew older he bought and sold horses to professional riders. My childhood was spent popping off to Ireland a few times a year and getting straight into being all horsey. My favourite things about his job was going to all the events, for example the RDS, Badminton and the Burghley Horse Trials! Moving on...this book gave me an insight into the riders experience of these events. I absolutely loved this One Dollar Horse as it showed Casey Blue going through the struggles of eventing and following her dreams. 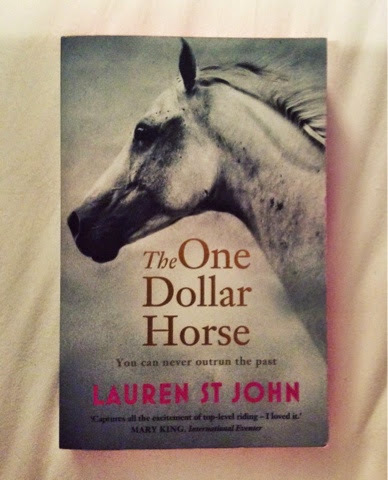 Unlike a few horsey novels I have read, One Dollar Horse is very gritty and shows what the real world is like beyond the glamourous front the horse world portrays. This book is well written, gripping and full of drama! Definitely a must read or horse lovers or just people who like to read all sorts! Ha ha.